So you want to learn about the most exciting industry, eCommerce? You’re in luck because that’s exactly why I decided to launch the eCommerce Training Academy. Our courses are still in the works but for now, I’ve gathered a list of ways you can get started. Those are the same ways I learned about eCommerce myself in addition to working in the industry for over 15+ years as a Director of eCommerce & Digital Marketing. 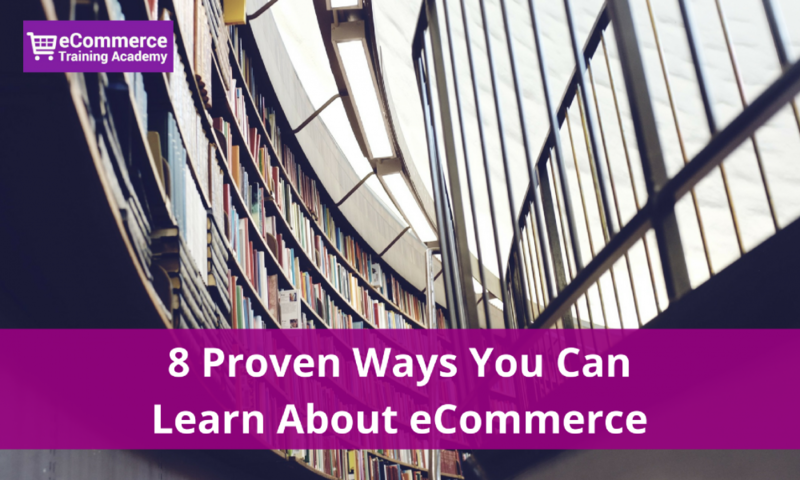 One of the quickest ways to learn about eCommerce is to read blog posts. I’ve included my favorite blogs since I’m always learning new things from them. I don’t have any specific courses to recommend as I haven’t found one that’s really good. That’s one reason why I decided to launch this academy. I usually don’t recommend eCommerce books since they become out dated very fast. Here’s a list of those I bought myself and found them to be very valuable. Instead of reading books, consider these popular eGuides are amazing! Download them for free. There isn’t a specific webinar I recommend but there many software providers & agencies that host webinars. For now you can try Practical eCommerce Webinars. One thing I enjoy most about eCommerce is the networking. It’s fun and exciting to meet new people. Whether you’re looking for online store owners or eCommerce professionals, networking makes it possible. My top 3 favorite ways to network are: Facebook Groups, Meetups and online communities. I left this one for last. Back in the day, opening an online store was hard. Now, with all the new technology out there, it’s much easier now to launch an eCommerce business. This doesn’t mean you will succeed but it’s one of the best ways to learn how to sell products online. I recommend you open a store on Shopify (affiliate link). It’s affordable, easy to setup, great support and offers a fantastic array of apps as well as a very active online community. We want to teach some high school students some fundamental skills to begin considering eCommerce as options during and after high school. What would be a good training options to begin the students or for the teachers to learn and training the students.